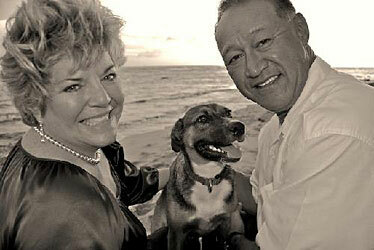 Debbie Weil-Manuma and Frank Manuma are shown with their pet, Caddy. The dog is believed to have been eaten after being taken from Moanalua Golf Club. Officially, police say the dog is missing. At first, the two suspects arrested for allegedly stealing it said the dog ran away. Later, one suspect said the animal was slaughtered and eaten. Honolulu police arrested two men, ages 58 and 43, both of Kalihi, for allegedly stealing the dog Sunday from Moanalua Golf Club, where they were maintenance workers. 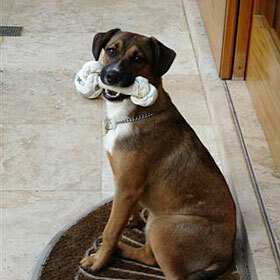 The dog belongs to a member who was given permission to leave his pet at the clubhouse while golfing. Police released the two men Monday pending further investigation. The Hawaiian Humane Society also is investigating the case. Caddy, who belonged to a Moanalua Golf Club member, is believed to have been taken while his owner golfed and later eaten. Caddy was an 8-month-old, 50-pound German shepherd-Labrador mix. His owners, Frank Manuma and Debbie Weil-Manuma, never had children. Debbie never even had a pet dog before. She said Caddy was their little boy. On Sunday, Caddy was taken from them, and they know he's never coming back. They said police told them two men confessed to stealing the dog and one said the dog was slaughtered and eaten. They said that was confirmed by a third person who told police the dog was taken to his house, where it was slaughtered. "The horrific part is knowing how he died," Weil-Manuma said, "I hope he didn't suffer. It's still kind of shocking." She said that police told her the thieves dumped what was left of Caddy into a river when they discovered police were looking for them. Manuma usually left Caddy at home with his wife when he went golfing in the morning and picked him up to ride along during his afternoon volunteer security shift at Barbers Point Golf Course. Caddy got his name because he was Manuma's golf buddy. During Manuma's security shift, Caddy sat in the driver's seat and Frank drove the golf cart from the passenger's side. But on Sunday, Manuma took Caddy with him to Moanalua Golf Club because his wife was on the mainland. She was scheduled to return that evening. Golf club manager Stephen Burke said the club doesn't allow members to bring their pets. "Frank is a relatively new member. He asked if he could bring it. We made an exception to allow him to bring the dog, then take it with him to work later," Burke said. Caddy stayed on a leash at the clubhouse while Manuma was on the golf course. When Manuma returned about 11:30 a.m., Caddy was gone. All that was left was his water and food dishes. Confident that Caddy was not lost but just with someone, Manuma went to his volunteer job while Burke looked for the dog. Burke discovered that two maintenance workers, whose shifts ended at 11 a.m., were seen taking the dog. "We had some members see them load the dog into the car," he said. Burke called police and called the employees back to work and fired them on the spot. He said one had been employed for about four years and the other, three years. Honolulu police arrested the men, 43 and 58, both of Kalihi, under suspicion of second-degree theft, a class C felony punishable by up to five years in prison and $10,000 fine. Police released them without charges Monday pending further investigation. "We're working with (the Honolulu Police Department) and are investigating the case from the animal cruelty aspect of it," said Kawehi Yim, Hawaiian Humane Society spokeswoman. Cruelty to animals had been a misdemeanor under Hawaii law punishable by a maximum of one year in jail and $2,000 fine. But earlier this year state lawmakers approved legislation designating the misdemeanor offense cruelty to animals in the second degree and creating a new offense, cruelty to animals in the first degree, a class C felony. It became law June 1. » Honolulu Lite: Returns in Jan.
Honolulu Lite: Returns in Jan.